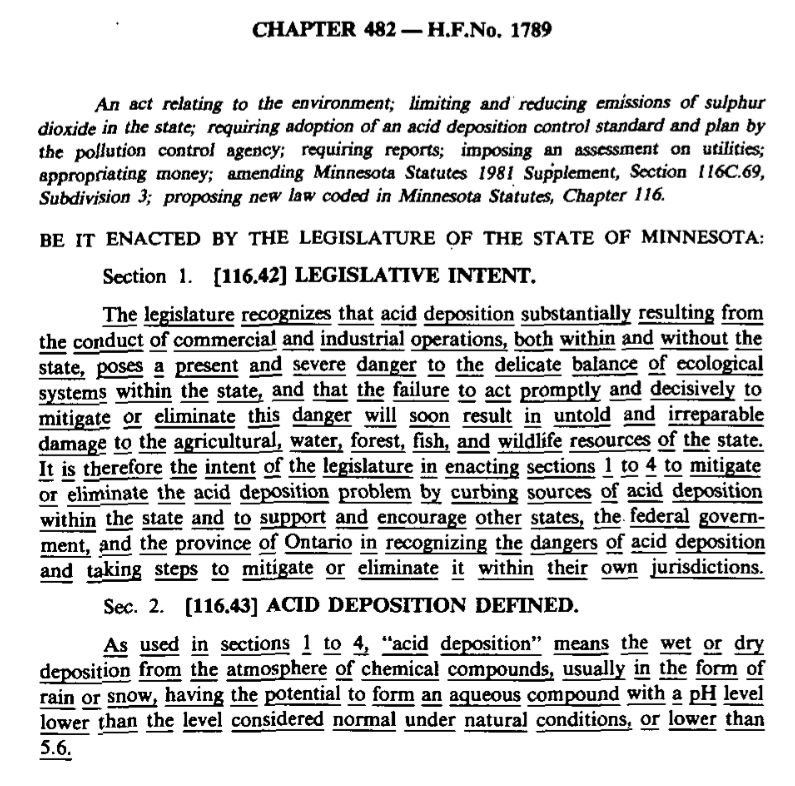 To experienced organizations committed to protecting Minnesota’s natural resources, acid rain presented a major but, ultimately, manageable threat. The citizenry of Minnesota took forceful action through the democratic process, and seemed to value environmental protection over their pocketbooks. Perhaps the most exciting and hopeful result of this political action was that it worked. The air quality is better today than it was in 1980 when the danger was first recognized. The threat of acid rain was recognized, combated, and to an extent, curtailed. This remarkable accomplishment is indicative of an environmental awareness and a proactive electorate. This is an example of what can be achieved when people recognize a threat to their environment and well-being, and take concerted democratic action to alter the course of events. Furthermore, Minnesotans chose to make personal and economic sacrifices to benefit the environment, costing themselves to protect the nature around them. This seems like a teachable moment in which one state confronted a national environmental problem and effected positive environmental changes. In setting our sights on new environmental issues, Minnesota’s acid rain story serves as a valuable reminder of the power of civic action taken against an environmental obstacle. Laws of Minnesota for 1982. Dr. Gregory Pratt of Minnesota's Pollution Control Agency discusses forms of progress to combat air pollution. Interviewed by authors. Maja Black, Sarah Goodman, and the Minnesota Environments Team, “A Success Story,” Minnesota Environments, accessed April 26, 2019, http://mnenvironments.carleton.edu/items/show/26. On acid rain, see Gregory Pratt, "Dissecting a Nation-Leading Legacy: The Minnesota Acid Rain Story," in Two Cities, One Hinterland: An Environmental History of the Twin Cities and Greater Minnesota, eds. George Vrtis and Christopher W. Wells (Book manuscript in progress, 2014); J. David Thornton; Steven A. Heiskary; Ronald D. Payer; John Matta, “Acid precipitation in Minnesota: Report to the Legislative Commission on Minnesota Resources. Minnesota Historical Society,” (Minnesota Pollution Control Agency, 1982).